For his first film since 1999, One Flew Over the Cuckoo’s Nest and Amadeus director Milos Forman decided to tell a story about a period of time he felt hadn’t been given proper screen consideration—namely an inside look at 18th century Spain during the last part of the harrowing inquisition. For his structural link-pin, he and his auspicious French co-writer Jean-Claude Carriere whose filmography includes collaborations with auteurs such as Bunuel and Godard decided to focus on controversial painter Francisco Goya, who, a court painter when the film opens has a unique first person view of the goings-on. 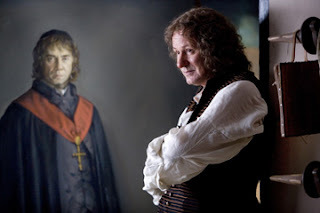 Swedish star Stellan Skarsgard portrays Goya as a blank canvas—unassuming, hard to read and mild—a man who just happens to be in the center of the drama when the lives of two individuals whose portraits he has painted intersect in shocking ways. Cast for what according to IMDb Forman felt was her uncanny resemblance to the “Milkmaid of Bordeaux,” Natalie Portman stars as Goya’s lovely young muse Ines, the daughter of a wealthy family who is subjected to the horrors of the inquisition after she’s called to testify. Her crime isn’t her association with Goya, whom the church feels has displayed dangerous commentaries on the Catholic Church in his works, but rather what the inquisitors feel is her curious refusal to eat pork while dining with her brothers. While Ines explains that it’s simply a matter of preference and she doesn’t like the taste of the meat, the inquisitors feel that she may be truly masquerading as a Catholic who secretly adheres to Judaism and proceed to torture Ines until she signs a confession thrust in front of her. Desperate to gain his daughter’s freedom, Ines’s father pleads Goya for help with introducing the family to Brother Lorenzo (Javier Bardem) who they feel will be able to secure her release. While 2007 found Bardem overshadowed by his other villainous role as the sociopath Anton in the Coens’ Cormac McCarthy adaptation No Country for Old Men, he turns in the best performance in Goya’s Ghosts as the cunningly devious Lorenzo who manipulates all he meets for his own gain. Nominated for three Spanish Goyas, the film’s ultimate saving grace aside from terrific portrayals by Bardem and also Portman playing dual roles is the sumptuous period photography by Spanish cinematographer Javier Aguirresarobe who has not only been tapped to shoot the upcoming adaptation of Cormac McCarthy’s The Road but also shot two of Spain’s biggest critical hits of the decade, The Sea Inside and Talk to Her.